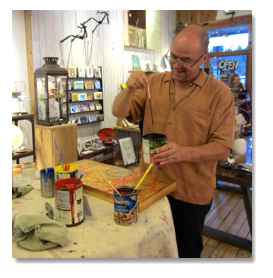 Raised in the high desert of Winnemucca, Nevada, Peter was raised by parents who considered art as a core family value. Studying and creating art were considered just as important as education and religion. Born the fifth child out of seven, Buchan and his siblings were guided by their parents to draw at a very early age. Buchan’s father John recognized his talent and encouraged him to pursue art, instilling in him the importance of productivity and discipline. Buchan honed his skills through self-study and discipline that involved learning the classics and practicing the technical skills required in pen & ink drawing, sculpture and painting. As a young adult, Buchan created pen & ink drawings, which earned him statewide acclaim. 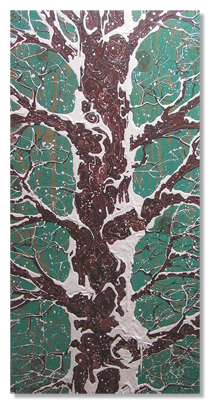 By 18-years-old, he was considered a talented, emerging artist, receiving accolades from the art community. Despite this success, Buchan believed he had another calling, and suspended his pursuit of becoming a professional visual artist. At age 19, he left his home town of Winnemucca to pursue a career as a singer in a rock and roll band. For nearly a decade, he focused his artistic energy in music, though he never stopped painting and drawing. In 2012, he quit his day job to pursue art full time. He produced work for solo shows, group exhibits and juried fine art competitions that earned him multiple regional, national and international awards. Buchan had the honor of placing 1st in a seascape competition with 629 entries from 22 countries around the world. He is currently teaching other artists what it took him 12 years to develop. His latest works are a series of “Dripscapes” inspired by the Kern River Valley, located in Sequoia National Forest, where he currently resides with his partner Marsinah.